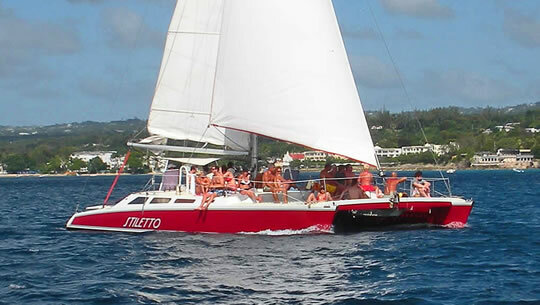 Come sail the calm, crystal clear waters of Barbados coastline, laying anchor just offshore where you can experience the unforgettable feeling of swimming and feeding the gentle sea turtles and schools of tropical fish, snorkeling coral reefs and shipwrecks, afterwards relaxing on deck enjoying a truly delicious Bajan buffet, the bar is always open. This is our most popular cruise. 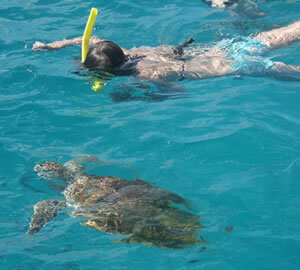 You sail along the coast and get the unforgettable experience of feeding and swimming with turtles. We stop to snorkel at a coral reef and ship wreck where you can hand feed colourful tropical fish. 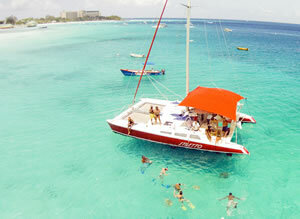 Afterward the catamaran turns towards the turquoise waters nearer shore. A delicious local buffet is served on board that is guaranteed to satisfy your appetite. You have plenty of time to relax, walk the beach, listen to good music, enjoy our open bar, swim and just 'cool out' before we set sail again. Price: $85 USD per person, children ages 3 to 12 pay $45 USD. You sail along the coast and get the unforgettable experience of feeding and swimming with the turtles as well as snorkeling at a reef and wreck. The Bar is always open and a light snack is served. Price: $70 USD per person, children ages 3 to 12 pay $35 USD. This cruise is the same as the 3 Hour Turtle-Snorkel day cruise except you sail in the evening to catch the sunset. We cater for Corporate Entertainment and Party cruises. For an even more personal sailing and snorkeling adventure, let us take you on your own private cruise. You can design the cruise to your liking and if you are staying on the West Coast we can collect you on the beach in front of your hotel or guesthouse. As we are a small family business we can offer reasonable rates for families or couples who want a boat for themselves. Our good humored local captain and crew know how to make your day on board the best day of your holiday! 3hr Charter $750US plus (first 15 people $15US per person thereafter $30US per person).